This Latin America and the Caribbean Netizen Report was researched, written, and edited by Juan Arellano, Renata Avila, Ellery Biddle, Lully Posada, Firuzeh Shokooh Valle and Silvia Viñas. Over the last ten years, Costa Rica, Brazil, and other countries in Latin America have proposed legislation that attempts to combat “computer” or “cyber” crimes. These bills frequently propose systems for identifying Internet users with the goal of catching those committing crimes such as fraud or piracy. As a result of these initiatives, the state collects the personal information of Internet users, running the risk of violating their right to privacy. In this edition, we discuss a recent example: the proposed Computer Crime Bill in Peru, which seeks to fight information and communication technology (ICT) “crimes” and would legalize the collection and analysis of personal information to this end. The bill has stalled in Congress thanks to strong response against the legislation from Peruvian and regional civil society, but the danger that it could be pushed through remains. In Panama, the National Assembly approved modifications to the controversial 510 Copyright Bill, described as “the worst copyright law in history” by Andres Guadamuz on his blog Technollama. The law would create a new system [es] for applying intellectual property regulations, which would violate the standards of civil due process and would allow fines of up to $100,000 to be isssued based only on the suspicion of copyright infraction. Read more about the law in an earlier edition of our report. Students protesting the prohibition on making photocopies. Photo by Diego Molina Moreira, Diego Molmo on Flickr, under Creative Commons License (CC BY-NC-SA 2.0). 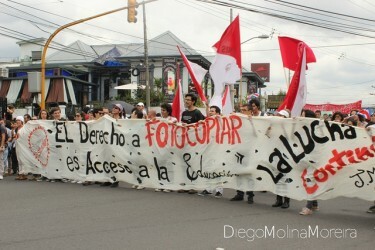 University students in Costa Rica have organized various marches to demonstrate against Bill 17342 (known as the “Photocopying Law”), which would modify copyright law to impose restrictions on photocopying artistic, literary, or technical text. Using the hashtag #FotocopiandoParaEstudiar [es] [Photocopying in order to study], opponents of the change argue that the freedom to photocopy academic texts should be protected to safeguard and promote democratic access to information and education. The National Assembly and President Laura Chinchilla disagree [es] on important aspects of the law. In Colombia, Pilar Sáenz, member of digital rights group Fundación Karisma [es] and one of the founders of RedPaTodos [es] [the Net for Everyone], participated in a congressional task force [es] on October 18 as a prelude to the first discussions on the Bill 001 of 2012 [es], which places limitations and exceptions on copyright. During the event, one of the items discussed was exceptions and limitations for the benefit of the visually impaired. The new website “ISP liability for copyright in the digital setting”, or ISP Liability [es], is an initiative that promotes research on, debate about, and contributions toward the creation of copyright and Internet Service Provider (ISP) liability norms in Peru. The site is a project of the Ministry of Foreign Commerce and Tourism [es] with the support of the Inter-American Development Bank. Their methodology and goals can be read here [es] and here [es], and you can follow the project on Twitter under the username @isp_responsab. However, some fear (take a look at the comments on this newspaper article [es]) that this could clear the way for the implementation of a SOPA-type law in Peru. With the next presidential elections in Ecuador on the horizon, there are signs that certain factions of the government would welcome policy to regulate social media. In our previous edition, we reported on the case of the daily publication El Comercio, which when faced with pressure from the government, shut down the option of commenting on its website. After the site's decision, a document [es] released by the Constitutional Court on the possible regulation of expression on social networks revived the debate, and again the president of the country's election commission, Domingo Paredes, protested in favor [es] of this type of regulation. Paredes declared [es] later that his actions had been misunderstood and the election commission released a statement [es] on the matter. However, Ecuadorian netizens remain uncertain [es]. In Colombia, journalist Daniel Pardo was fired from the website Kien&Ke [es] after writing a column [es] on the influence that Canadian oil company Pacific Rubiales had wielded over media outlets such as W Radio [es]. The piece [es] revealed how Pacific Rubiales had manipulated the public with paid infomercials registered as journalistic work. The issue [es] raised alarm on Twitter and blogs, pressuring editor-in-chief of Kien&Ke, María Elvira Bonilla, to ask Pardo to return. Pardo declined, and Bonilla resigned after admitting her error publicly. Harold Abueta, managing editor of Kien&Ke, and blogger Johanna Pérez Vásquez, also resigned. Pérez Vásquez explained her reasons for quitting on the blog equinoXio [es]. In Trinidad and Tobago, the personal information of reporter Anika Gumbs-Sandiford of the Trinidad Guardian was leaked to Chaguaramas Development Authority (CDA), a state organization in charge of a national park. Gumbs-Sandiford had published reports that claimed that the CDA was involved in corrupt financial practices. The case received a lot of coverage from local media, and various international news agencies and Reporters Without Borders have called for an independent investigation into the incident. On social media, the incident was characterized as entering “dangerous territory.” Global Voices wrote about a similar incident in March of this year. In Mexico, blogger and creator of the well-known blog El Santuario, [es] Ruy Salgado, who disappeared on September 8, 2012, made his last transmission on October 20 after more than a month of silence. Salgado gave a lengthy speech [es] online saying goodbye to his followers and explaining that he would cease to be the public face of the opposition for the sake of his and his family's safety. Known for his support of ex-presidential candidate Andrés Manuel López Obrador and the#YoSoy132 [I am 132] movement, Salgado covered cases of corruption within governmental organizations. Salgado also referred to a “forced” disappearance, the result of the “failed narco-state,” but didn't give more details about his experience in the last five weeks. At the end of October, the vice president of Bolivia Alvaro García Linera declared that he has begun to review social networks (Facebook specifically) in the search for users that insult President Evo Morales: “I am always going online and writing down the first and last name of those insulting our president.” Officials suggest that the vice president's statements could mean the revival of the Social Network Regulation bill [es], which would bring legal action against those who insult the president on social media. However, President Morales responded [es]: “We have read many things, but the vice president has never said that these things should be controlled or shut down; we love to inform ourselves about what the opposition is saying, and they have the freedom of opinion, even if with so many adjectives, but that is part of a democracy.” The vice president also admitted [es] that it would be nearly impossible to create a system for the regulation of social media content. At the root of debate surrounding the Computer Crimes bill in Peru, a group of those interested in the matter have created the platform Una Mejor Ley de Delitos Informáticos [es] [A Better Computer Crimes Law] for debate and feedback. There they propose five points that “will help the formation of a Computer Crimes Law that ensures our security without endangering our fundamental freedoms.” Miguel Morachimo, one of the driving forces behind the platform, wrote about it for Access Now. Also in Peru, the director of the Authority for the Protection of Personal Information (APDP) announced the creation of a Registry of Personal Information, despite the organization's own deadline for contributions from citizens about the proposed Protection of Personal Information Law [es, PDF] not having passed. Specialist Erick Iriarte wrote [es] that the authority should have waited to receive all contributions [es] from the citizenry because important criticisms of the most recent version [es] of the bill remain unanswered. Blawyer [es] has published more opinions about the law. Frank La Rue, the special rapporteur for freedom of opinion and expression for the United Nations, published his annual report [PDF], “Promotion and Protection of the Right to Freedom of Opinion and Expression” in June. The report attempts to paint a picture of the state of freedom of opinion and expression in various countries around the world, to document abuses of those rights, and offer legal solutions for those abuses. You can find reports from previous years on the UN website. The most recent publication [es] from the Center for the Studies of Freedom of Expression and Access to Information at the University of Palermo in Argentina, “Domain names: an expression that deserves to be protected,” analyzes the current administrative system of domain names from a perspective that considers domain names as a form of expression and opinion. The Journalism in Computer Security [es] competition in Guatemala, an initiative developed by software security company ESET Latinoamérica [es], awards the work of professional journalists who write about technology. This year, the competition brought together journalistic work focused on computer security from around the entire region. The prize for Best Journalistic Work in Computer Security this year was awarded to Alejandra Soto for “Danger on social media,” a report about the risks of social networks. On December 1 and 2 of this year, six Latin American countries will participate in a regional hackathon called Developing Latin America, organized by the Fundación Ciudadano Inteligente [Intelligent Citizen Foundation]. The initiative brings together multidisciplinary teams of developers, designers, journalists, project leaders, entrepreneurs, and citizens seeking to find -through technology- solutions to problems that span the region. Ticoblogger [es], a community of Costa Rican bloggers, held the forum “Anonymity online, pseudonyms, and freedom of expression” [es] on October 24, 2012, in the Legislative Assembly in San José, Costa Rica. The forum discussed article 230 of the Cybercrime Law, which penalizes impersonation on the Internet. Ticoblogger summarized [es] the involvement of bloggers, journalists, and activists in the forum, and included links to the presentations of Gustavo Araya [es, PDF], Julio Córdoba [es], and José Medrano [es]. To finish up, we want to welcome Hisham Almiraat, the new director of Global Voices Advocacy. Blogger and co-founder of the citizen journalism projects TalkMorocco and Mamfakinch [fr], Hisham has actively participated in Global Voices for many years and has a lot of experience in activism in Morocco, where he currently resides. Welcome Hisham! What Do Argentinians Give Up in Exchange for “Free” WiFi in Buenos Aires? Pingback: Digital Forensics, Inc. Latin America and the Caribbean Netizen Report: Cybercrime Edition – Global Voices Online | Digital Forensics, Inc.